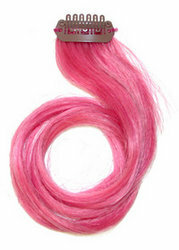 Clip in colored hair extensions are great for adding a burst of unusual colour to your own hair. You can choose to go all out with hot pinks or take things down the electric blue root if that suits your style and hair are your quick fire questions (hair geddit? Instead of here we said "hair" as a play on words..well it made us laff...oh and yes, we know that we've used the American spelling of the word...). "Which clip in colored hair extensions should I choose?" If you’re deliberating about your clip in coloured hair extensions and you find that you're not feeling brave why not just opt for deep reds or browns to add low-lights to your hair. If you are feeling brave then go for it with streaks of pink, green blue and scarlet red. "How Many Clip In Coloured Hair Extensions Should I Buy?" If you’re going for the really bright coloured hair extension clips then you won’t need more than a hand full. If your tones are more muted then you can opt for about 5 – 10 single clips. "Which Colours Suit Which Skin Tones?" The great thing about clip in colored hair extensions is that any colour can suit any skin tone. They key is tone and there's a guide about how to match hair colour with skin tone, however for the purposes of this article there are two ways to go about choosing colours. You can easily contrast your dark hair with bright colours or the other way around. Contrasting opposing shades suits all skin tones. This is a good place to start. Using your existing hair colour, choose a coloured clip in hair extension that will blend in with it, so if you have brown hair, then auburns, or caramels; if you have blonde hair then caramels to honeys. This method will allow the extension you choose to compliment your skin tone. The main thing to consider is what look you’re trying to achieve – funky and dramatic, or sophisticated and subtle. 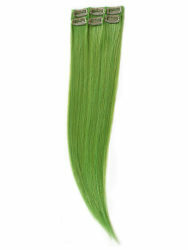 "What Lengths of Clip In Colored Hair Extensions Should I Choose?" If you can find coloured clip in hair extensions that are the same length as your own hair then choose that, if not it’s always better to choose a length that is shorter than your own hair rather than longer as it blends better with your hair to give a more professional look overall. Whatever length you choose, it's worth remembering that curly and wavy clip hair extensions are measured in a specific way and it's important that you understand the measuring system, because when buying clip hair extensions online, not all retailers are willing to accept hair extensions being returned based on a misunderstanding of item description. Straight textured clip hair extensions are measured in the ordinary way but keep in mind that single drawn hair always has fuller roots and thinner ends and this is the same for wavy clip-on hair and curly clip-on hair extensions. "Which Is Better, Single Vs. Multi-Clip?" Folks, the choice here is all yours, it you like full expanses of colour, then go for it. If however you just want to spice up your look then single clips are better as they more versatile in their application. So there you have it, the world of clip in colored hair extensions at your hair tips!